For years, school reform efforts targeted either students in regular education or those with special needs, but not both. As a result of the No Child Left Behind legislation (NCLB) and its focus on accountability, administrators established policies that would integrate the needs of students who previously were served under separate frameworks. 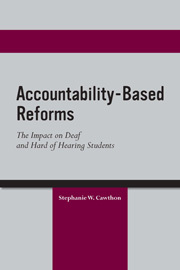 Using the NCLB structure as a starting point, Stephanie W. Cawthon’s new book Accountability-Based Reforms: The Impact on Deaf and Hard of Hearing Students discusses key assumptions behind accountability reforms. She specifically examines how elements of these reforms affect students who are deaf or hard of hearing, their teachers, and their families. Cawthon begins by providing a brief introduction to the deaf education context, offering detailed information on student demographics, settings, and academic outcomes for deaf students. She then outlines the evolution of accountability-based education reforms, following with a chapter on content standards, assessment accommodations, accountability as sanctions, and students with disabilities. The remaining chapters in Accountability-Based Reforms closely examine educational professionals accountability, and students who are deaf or hard of hearing; school choice policies and parents; and deaf education and measures of success. Each chapter presents an overview of an important component of accountability reform, available research, and how it has been implemented in the United States. These chapters also offer recommendations for future action by educators, parents, researchers, and education policymakers. Stephanie W. Cawthon is an associate professor in the Department of Educational Psychology and the director of the Deaf and Hard of Hearing Institute at the Meadows Center for Preventing Educational Risk at The University of Texas at Austin. She is also the director of the National Deaf Center on Postsecondary Outcomes.